My name is Neil Smith and I live in the western highlands of Scotland and have a passion for ice climbing. Over the past 27 years I have observed a dramatic change in the ice conditions through out the Scottish highlands. I find the warming winter trend that I have been observing, disturbing. Scottish ice climbing has a strong historical link to the roots of ice climbing and has some of the most challenging and adventurous winter climbs in the world. Tom Patey, Robin Smith, Dougal haston and Dave Cuthbertson are some of Scotland’s great climbers who learned their skills on Scotland’s mountains and carried them on to the greater ranges around the world. During the mid eighties we in Scotland experienced the coldest temperatures recorded, great low lying water falls were frozen solid, Greymares tail and The Falls of Glomach to name but two. Both of these waterfalls are amongst the highest in Britain but are both about 300 metres above sea level, when frozen solid they are beautiful climbs. Very cold winters also occurred in the 1960s and 1970s but have not occurred again since 1986. 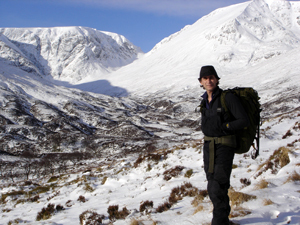 The Scottish mountains, although small compared with other mountain ranges, can produce real arctic conditions. The Scottish Highlands are 60 degrees north of the equator and historically used to having regular harsh winters. I certainly remember the abundant frost and it would arrive much earlier than recent winters. Milder winters are driving snow elevations higher and producing more rain. Ice climbing in Scotland may become a thing of the past? Since the mid 1990s the lower mountains have yielded very little ice climbing. It may snow, and then freeze, but exceptionally mild weather would arrive and strip the mountain bare again. More often now I find myself rock climbing on the Isle of Skye soaking up the sun in February! But I would rather be ice climbing. The mountains between 2500 feet up to 3500 feet height are spread across the northern half of Scotland and contain a large number of classic ice climbs. These routes where popular and climbed usually from early in the winter season, which starts in early December and ends in late April. I have worked two weeks away from home and two weeks at home for several years. Usually when I am at home, I would expect to find a route I particularly wanted to climb, build up sufficient layers of snow and ice to make it climbable. You would expect to find sufficient ice build up at some time during the five-month winter climbing season. 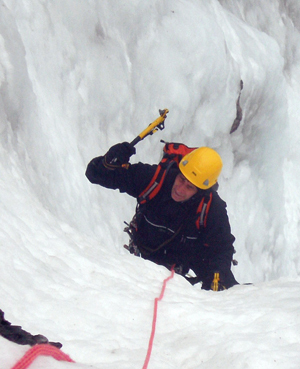 Scottish winter climbing depends on a combination of both cold and warm weather fronts. Heavy dumps of snow cover the mountains, this is usually followed by a warm weather front bringing about a slow thaw, a cold front will then arrive and the ice will begin to form where the thawing snow was draining. The winter of 2006/7 was another poor winter for the lower mountains even the mid-height mountains suffered. I climbed exclusively on Ben Nevis (western isles of Scotland) Scotland’s highest mountain and one of the only mountains to offer guaranteed ice climbing. Although some climbs were in perfect condition a great many other climbs were not. I waited patiently for ice climbing conditions to form on the lower mountains but yet again it didn’t arrive, instead we received the warmest spring since records began! I would hate to see Scottish ice climbing becoming confined to the history books it would be such a shame, but it looks like a real possibility and with in a relatively short time period. This Climate Witness previously submitted comments to a BBC and Institute for Global Environmental Strategies survey asking how climate change has affected people where they live. While I am not aware of any specific analyses that address the exact mechanisms of ice formation that Neil describes, his observations are broadly consistent with meteorological data for the last thirty years or so from Scotland. Temperatures have increased and the number of intense cold spells each winter have, on average, decreased. Further, while total precipitaiton (rainfall plus snow) has increased over Scotland, the warmer temperatures mean that more of this precipitation has fallen as snow. The number of days with lying snow each year have similarly decreased, by up to 35%, since the 1970s. Thus on average, there is less snow to melt and re-freeze and there have been fewer cold spells to refreeze any snow that has melted. Climate in Scotland is closely related to a mode of variability in the atmosphere called the North Atlantic Oscillation (NAO). For last few decades the NAO has been predominantly in a phase the encourages warm and wet winter conditions over Scotland. While the recent trends in climate over Scotland are very clear, disentagling the relative roles of larger scale greenhouse gas warming and the recent positive phase of the NAO (and indeed whether the positive NAO is itself a global warming signal) remain an area of current scientific research. “An online handbook of climate trends across Scotland”. A report of the Scottish and Northern Ireland Forum for Environmental Research (SNIFFER).